I’ve been up to the house of my friends Phil and Karen several times this summer. They have a home that sits on the Hudson River between the Bear Mountain Bridge and West Point. Phil and Karen have a butterfly bush: every time a butterfly stops by their house, it cannot resist stopping at this bush. Phil and Karen let a friend moor his boat off their dock. Occasionally, we go out for a ride on the Hudson. West Point looks very nice at sunset. The train ride leaves from Grand Central and runs along the Hudson–it’s a beautiful trip. 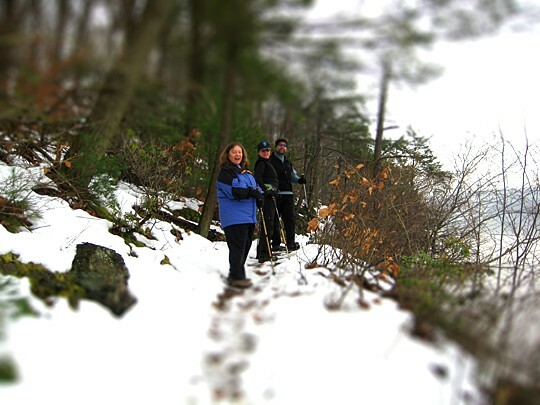 When I visit my friends Phil and Karen in Garrison, New York, one of my favorite places to hike is Mystery Point. It’s a small piece of land the juts out into the Hudson around 10 minutes north of Bear Mountain Bridge. I’ve visited Mystery Point in the past few months. One of my visits was December 27 of last year. The tide at Mystery Point was very low, and the water level was very low. December 27 was relatively warm, but the ground was still covered with snow. A light haze covered the water, and you could see it accumulate as you looked into the distance. Every now and then you see odd artifacts; this hook was embedded into a large boulder at Mystery Point. Was it used to dock small boats? Was it part of a larger structure? Around 100-200 yards north of Mystery Point is a loading dock; perhaps this was part of that infrastructure. Even in the middle of winter, there are splashes of bright colors all around Mystery Point. The bright red flowers seemingly pop out of the middle of boulders. Mushrooms and other fungi abound. My friend Anne frequently hikes up to Phil and Karen’s house. Phil has been doing quite a bit of hiking–I think he wants to hike the entire Appalachian Trail in New York. Karen, Anne and Phil on the goat trail next to Mystery Point. Tilt-shift effects can sometimes be fun…. I went back up to Mystery Point last weekend. Spring has already arrived at Mystery Point, yet it was a bit surprising how much the weather, water, and land resembled the weather of late December. Wildlife abounds at Mystery Point. My friend Kathy took a fantastic photo of an immature bald eagle on the Hudson next to our friends’ house. She was also kind enough to lend me her camera for this most recent trip since I had left mine at home. One of the signs that Spring was arriving were the large number of red-winged blackbirds migrating back. They had a distinctive call and a stunningly sharp and bright swatch of red and yellow on a black body. Metro North and Amtrak share a train line that runs parallel to the Hudson. Near Mystery Point is a bridge where you can see the train motoring North and South. I created two stop-motion images of both trains: Stop motion #1 of train next to the Hudson Stop motion #2 of train next to the Hudson. Of course, I also have the individual photos that made each video. Two websites caught my eye after the crash. The first was FlightAware, which provides live tracking of airplanes. You can see the minute-by-minute progress of flight 1549; I’ve also grabbed a screen-shot from flightaware.com. Another site that had a unique view of the rescuers was Tugster. I mentioned this website previously; Will Van Dorp had some terrific photos of the ships involved with the rescue. Incidents like this make me proud to be a New Yorker–the city has so many heroes. My friend Phil notes that this is a crane; the large posts are pylons that sink into the riverbed and keep the crane steady. I wasn’t able to find any references to this barge in five minutes of searching, but I did find this interesting blog about the New York Harbor. A couple of weeks ago, I decided to visit my friends Phil and Karen at their house by the river near the Bear Mountain Bridge. I had already missed the morning train to Manitou, where they live, so I decided to take the train to Garrison and hike back to their house. It’s only four miles, and I was able to make the hike in under 90 minutes. It was a beautiful day; the leaves have just started to fall off the trees, and the last of the fall foliage was visible. The hike was very relaxing, even if most of it was along Route 9D. It’s a bit difficult hiking along a highway because the road is sloped and there are no pedestrian trails. After around three miles along Route 9D, I headed down a twisty road towards the Outward Bound headquarters. The headquarters is a large 10 bedroom building on 18 acres; it’s for sale for $9MM. Taxes are around $51K per year. You cross over a bridge over the MTA tracks to get to Mystery Point. After walking by the Outward Bound headquarters, I walked down Mystery Point Road towards my friends’ house. I hung out at Phil and Karen’s house for a few hours before catching the 5 pm train back to New York City. I also took a stop-motion video of the hike down Mystery Point Road; unfortunately, it didn’t compress well. Last Thursday Evening, October 16, Anne and I went to the Rise Bar at the Ritz Carlton in Battery Park to wish the Queen Elizabeth 2 farewell to New York City. The QE2 is on it’s final voyage; after returning to England she will be moved to Dubai as a museum. It was a windy, gray night, but the managers at the Rise Bar had the balcony open so that we could see the QE2 along side the much larger Queen Mary 2. The ships are both very impressive, but the QE2 looks more like a classic ocean liner than the QM2. Even though I had a tripod, it was difficult to keep the camera steady due to the fierce winds. The New York Times has an article about the departure. And, of course, let’s not ignore the “it’s a small world” moment. The New York Times reports, “A duplicate of the pennant was presented Thursday to Grover Sanaschagrin [sic], 88, who as a harbor docking pilot guided liners to their berths from 1944 until his retirement in 1996.” I believe this is the grandfather of Grover Sanschagrin, my coworker at PhotoShelter. Last weekend, I rode on a yacht, had food poisoning, and climbed Anthony’s Nose. I took Friday, October 3rd off to sail around the New York Classic Week Regatta, a schooner race around New York Harbor. Anne, Ginny, and I met at Chelsea Piers to board the yacht Manhattan. We paced most of the race to the Verrazano-Narrows Bridge and then made our way up the East River before heading back to the finish line at the Hudson. There was a bit of extra time, so we continued up the Hudson to see the Intrepid before returning to dock. The day was overcast, but it was still pleasant outside and we all had a great time. We were supplied with a brunch of waffles, quiche, ham, salmon, and bagels; not to mention a fully stocked bar. New York harbor is a working harbor, and the sailboats navigated along large container vessels and barges. Turning at the Verrazano-Narrows Bridge. The Manhattan was comfortable, fast, and fun. It’s worth looking into if you want a pleasant cruise around the city. The New York City Waterfalls. The project just finished this past weekend. We were able to get very close to the falls. The day before our ride, the Intrepid returned to its permanent berth. The view of Manhattan from the middle of New York harbor. Unfortunately, several hours into the ride, I started to become sick. I was still fatigued and weak after the ride, and took a nap when I went home. I woke up shaking several hours later and realized that I had food poisoning. I don’t think it was from the food on the ship since no one was ill; I think it was from my breakfast at a coffee shop or my lunch the day before. The details are a bit gross, but the good news is that my fever broke that night at 3 am, and by the end of Saturday I was in good shape. So on Sunday, I went up along the Hudson to visit my friend Phil at his house in Garrison. Anne, Mary, Phil, and I started out the day by climbing Anthony’s Nose, a peak overlooking Bear Mountain. We climbed the mountain fairly quickly; it’s a fairly easy, but steep, climb with a beautiful view. Phil and Mary at the peak of Anthony’s Nose. Climbing down the mountain, I saw many weird looking mushrooms. I would have taken more pictures, but I didn’t want to keep everyone waiting. I didn’t do as much this past weekend, but I did walk down to Brooklyn Bridge Park with a friend of mine. It was a clear, warm day. I finished up the weekend playing with my camera. I want to work with the strobe to see if I can capture better images of water droplets. This past Sunday, August 31, the Working Harbor Committee held the Sixteenth Annual Great North River Tugboat Race & Competition on the Hudson River. My friend Anne and I went to Pier 84 at 44th Street. All of the tugboats line up at Pier 84 and parade up to the starting line at the 79th Street Boat Basin. Then they race as quickly as they can back down to the finish line at Pier 84. Here are some photos of the tugs before the race. The crane ship from the U.S. Army Corp of Engineers marks the finish line. The NYFD was also on hand. Lined up for the start of the race. After the race, the tugboats participate in other competitions, like a pushing competition. They go head to head, and the tug that is pushed backwards loses. More tugs hanging out on the river…. The crews of the tugboats compete in a line throwing competition. The Tug Pegasus was built in 1907 and is the oldest Tugboat in the New York City region. After the race, the tugs dock on the pier, and you can get a very close look.